The importance of correct interpretation of Scripture is discussed in this book and how interpretation leads to application, whether correct or not. It’s not about gaining knowledge or having an education to be able to understand and interpret the Bible. Rather we are to imitate Christ and follow how He interpreted Scripture. Examples are given of how Christ interpreted the Bible in His talks with the Pharisees. It is also shown the method that Christ used to interpret when He walked and talked with the 2 disciples on the road to Emmaus. Often people are intimidated over how to interpret the Bible and think that they need to have a Bible college degree to be able to understand it. They rely on pastors and other leaders to interpret the Bible for them. But a degree is not needed in order to interpret the Bible. Through the Holy Spirit all Christians are able to read and interpret the Bible for themselves. Thus it is important to interpret rightly so that application is correct. Bad interpretation leads to bad application. Ultimately, all Scripture points to Jesus. Reading the Bible in light of who Jesus is, rather than reading it for how it can help us, will help lead to proper interpretation and application. All in all, a good reminder of the importance of interpreting Scripture rightly in order to apply it rightly. The book starts out with a definition and explanation of what creeds, confessions, catechisms, and councils were in the history of the church. It then goes on to talk about some of the particular creeds, confessions, catechisms and councils. While not covering all of them, the book gives a good introduction to the main ones that occurred throughout history. For each one, a historical background is given, as well as the content and the relevance for us today. I thought it was good that a section on relevance was given to show us that these have importance even for our lives today. Some of the most important doctrines, such as the deity and humanity of Christ and who the Holy Spirit is, were hashed out and defined in these councils and creeds. In the reading of this book, I now want to go back to a book I started and gave up on a while ago – Kevin DeYoung’s The Good News We Almost Forgot about the Heidelberg Catechism. I also now want to read the Westminster Confession of Faith, which is apparently very Calvinistic. I remember being taught some catechisms when I was growing up – likely from the Westminster Catechism. This book is a great introduction of some of the key events and documents throughout church history. It actually whets the appetite to dig further and find out more about them. And it also can be seen how some of the heresies and false teachings that we see today are nothing new but were battled in the early centuries of the church. *I received a copy of this book free through Book Look Bloggers from the publisher in exchange for my review. A short, concise book on the inductive Bible study method – observation, interpretation and application (called OIA throughout the book). The author walks through each step, giving examples and questions to ponder to learn this method of Bible study. While I was already familiar with this Bible study method, this is a good book explaining each step and making it practical for those who struggle with studying the Bible. The example he used throughout the book was Genesis 1 and I’m not completely sure I agree with his conclusions, but the explanations were clear and easy to understand. This is a great book for those who struggle with Bible study and need practical help to dig further into the Scriptures. Easy to read and to-the-point, this book will help make Bible study come alive. When I saw that this book was coming out, I put it on my wishlist. When it became available for review, I jumped at the chance to read it. And I was not disappointed! The author talks about the lack of Bible literacy and the need for us to dig deeper into the Bible in order to better know what it says. Also, she addresses our tendency to read the Bible for information about ourselves rather than reading the Bible for what it is – a book about God. The Bible helps us to better know God, which in turn helps us to better know ourselves. But first we need to read it to learn about God. In order to do this, we first need to ask the “archaeological” questions: who wrote it, to whom did they write it, when was it written, why was it written? It is important to read the Bible in context, which includes its historical context. We need to determine what it meant to the original writer and readers in order to better understand what it means now. It can never mean what it never meant. Then the book talks about the 5 P’s of Bible study. Reading with purpose, perspective, process, patience and prayer. Each point is delved into and fleshed out practically. For process, the inductive Bible study method is discussed – comprehension (otherwise known as observation), interpretation, and application. At the end of the book is a section addressed to teachers – how to teach a Bible study and pitfalls to avoid. I loved this book! I got it as a Kindle book and now I want to get the physical book to have as reference. Bible study is one of my passions and this book spells it out very clearly – not just the importance but the nitty-gritty of how to do it. Highly recommended! Release date of July 31, 2014. *I received a copy of this book free from the publisher through Netgalley in exchange for my review. This book made me want to read Calvin’s Institutes. An overview of what Calvin taught, it also provides a glimpse into who Calvin was, the kind of man he was. Going over Calvin’s teachings on God, it also talks about Calvin’s beliefs on the Sacraments of baptism and communion. I didn’t realize Calvin’s teachings on these before. The book also talks about Calvin’s views on Christians’ involvement in their culture and vocational views. It appears that Calvin did not try to be politically involved other than what he had to be. I learned more about what Calvin believed than I had realized before. There is a lot more to the man John Calvin than the 5 points that are often associated with him. Horton’s books can be a bit difficult to get into, but once you are into them they provide good fodder for thought. I did learn more about what Calvin taught and I don’t think I agree with his views on communion. For those interested in learning more about Calvin, this would be a good overview of his teachings and a brief biographical sketch. *I was provided a free copy of this book from the publisher in exchange for my review. The Logos Network publishes the Bible Study Magazine. I was given a free copy in exchange for a review. The issue I received was the May/June 2014 issue. My review – overall, I thought this was a good magazine. There are articles relating to Bible Study and an actual 8-week study is included. In this issue, the study goes through the Sermon on the Mount. Other articles from this issue included exploring the 4 Gospels and the themes that are evident in each. Tips on studying a parable in Luke are given. As with most magazines these days there are a lot of advertisements. But I would say the articles are well-written and good for increasing our understanding of the Bible, as well as encouraging us to dig deeper and study the Bible more thoroughly. I am not in agreement with some of the people that they feature in the magazine, but it seems to be coming from a broad evangelical standpoint. So others might not have a problem with the people that are featured. In spite of that, if I had the money, I would probably consider subscribing to the magazine. Thanks to Logos and Bible Study Magazine for the free copy! I love coming across different Bible reading plans! The trouble is, there are so many plans out there that it’s highly unlikely I will be able to try them all in my lifetime. If you come to my actual blog page Sojourner Between Worlds rather than reading through email or a reader, on the right side of my blog page is a list of various Bible reading plans from various websites under the section titled “Bible Reading Plan Links”. Having recently completed reading through the Bible in 90 Days, I wanted to use a plan that would take me through the Bible by the end of the year. I decided to try the Professor Grant Horners Reading System. This plan involves reading 1 chapter from 10 lists each day (so 10 chapters a day). Each list is from a different section of the Bible. As you can see from the above picture, Psalms is its own list, as well as Proverbs and Acts. Not all the lists have the same number of chapters, so when you finish a list, you start again at the beginning of that list while continuing on with the other lists. 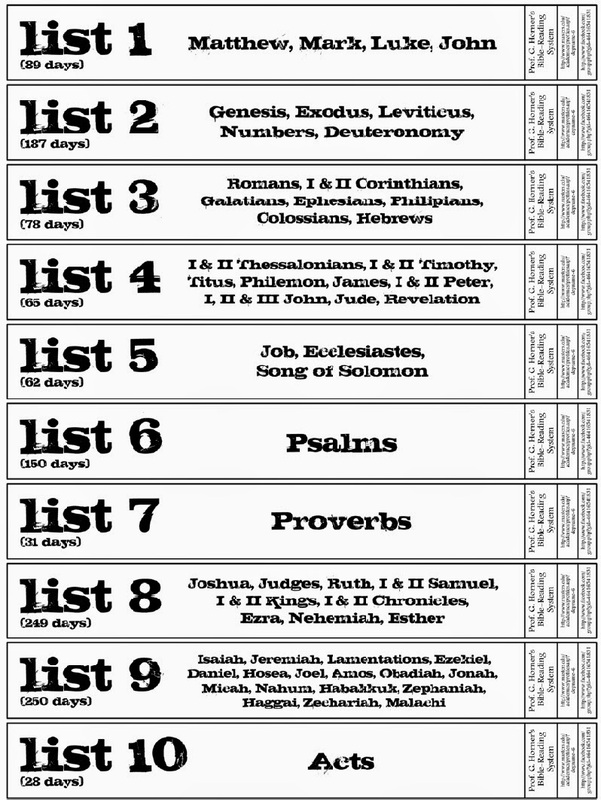 The longest list is List 9 (Old Testament prophets) which takes 250 days to get through. So I will have completed the whole Bible by the end of the year, while having read some portions (such as Proverbs and Acts) several times. I’ve been doing this for over a week so far and am really enjoying it. It is a lot of reading, but not as much as was involved with the Bible in 90 Days. Also, I’m a pretty fast reader and can get through 10 chapters in about 20 minutes. That will vary with longer chapters (such as Psalm 119). I’m using the Net Bible Reader’s Edition to go through this reading plan. I’m thinking that with as fast as I read, I may be able to read through the Bible every 6 months or so rather than taking a year to do it. So with the different reading plans that I want to try, I can just read 2 days’ worth of reading to finish the plan in 6 months. So the plan is to stop doing the Horner plan at the end of the year (it is actually a perpetual plan, not necessarily a yearly one and can be modified as needed for less chapters each day). 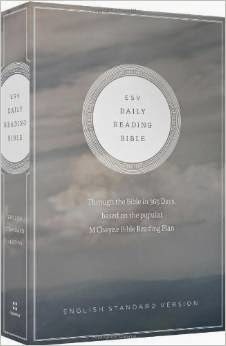 Starting in January of 2015, I hope to start the ESV Daily Reading Bible. This Bible uses the M’Cheyne Reading Plan, which is designed to take the reader through the New Testament and Psalms twice in a year, while reading the rest of the Bible once that year. I may try to do this in 6 months, but will have to see as it is more than reading through the entire Bible just once. What kind of reading plan do you use for reading your Bible regularly? Have you found a plan that works well or still trying different ones out?